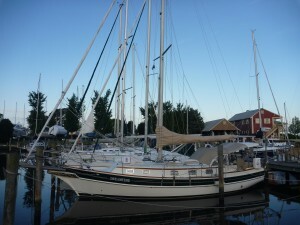 A few evenings ago we met another couple who have been cruising for 10 years between the Chesapeake and the Caribbean. They have made the difficult decision to put their boat (40′ Island Packet) up for sale and are moving back to land with mixed emotions. Better to make that decision on their own terms rather than the sea or life in general making the decision for you they thought. In the past 10 years they have done a few home visits, and in the past year have only spent 3 nights in a marina. So they really have been living on the hook. They are finishing their rendition of the life we are just embarking on and it was great to just sit and chat with them over a wine and beer. What struck me when talking with them was the contentment they had regarding the decisions they made and the life they chose to live for the past 10 years. They talked about how their relationship grew stronger because of it, and because of all the time they spent with just each other. It was really quite lovely. I could see them remembering the excitement and newness we are currently experiencing with a twinkle in their eyes. It really is good to connect with people who have been living the dream. What’s that behind Bob? Could it be land? And what’s between Bob and the land? Could that be water? Yesterday we ventured out of the slip, past the breakwater and into the Bay by ourselves – woo hoo!!!! There was absolutely no wind and the Bay was like a lake of still water, so the sails did not go up, but we did go out. I must report that I LOVE the new headsets we bought. They are bluetooth connected and allow Bob and me to talk to each other as if we were right next to each other even when we are on opposite ends of the boat. It was great to have him right in my ear. I was able to tell him when the dock lines were free, when I saw crab pots to avoid, and he was able to tell me what he needed me to do. Bob reported loving them too – that is until I sneezed and nearly blew out his eardrum, oops. And again as we passed by some new friends (more on them in the next post) and I called over to them while still wearing the microphone. Lessons learned – cover the mouthpiece when I am not talking directly to Bob and when sneezing. We left the slip, motored out into the Bay for about an hour or so getting more familiar with the navigational aids and markers, and re-entered the slip without incident. I enjoyed being at the bow and seeing the sights. 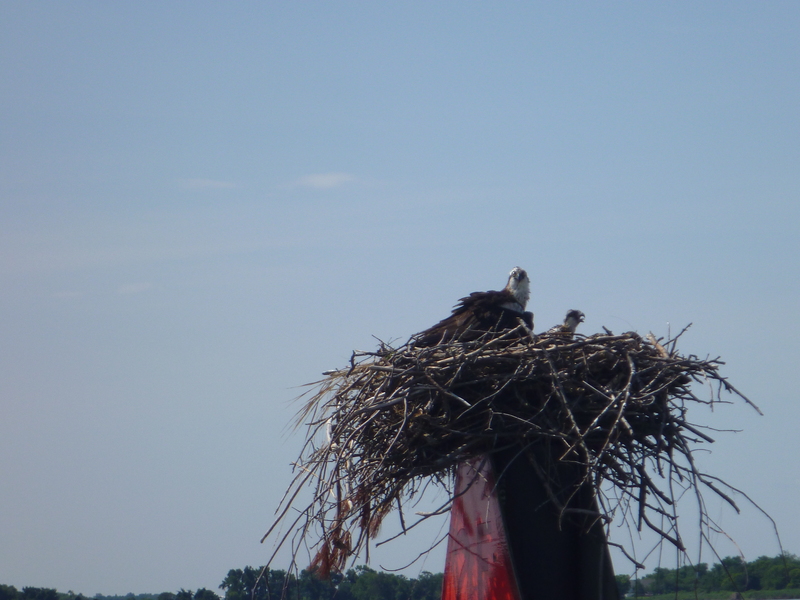 Osprey nest atop the channel markers but don’t like boats getting to close to their young. This mother let us know she was not pleased. When we returned to the dock we tested the genoa (front sail) and staysail (middle sail) to be sure they would run smoothly and we would have no major surprises when we actually get to use them. We are definitely getting better with prep work before departure and set-up work after arrival. The air conditioning was re-installed easily, the sail cover was reattached relatively easily (it probably helped that the sail hadn’t been used), the windshield/windscreen cover was replaced easily and even the middle piece of canvas between the bimini and dodger was reattached without drama (or cussing). We didn’t time the process, but it didn’t seem to take nearly as long as the first two times. But yes, we were both still covered in sweat by the time the processes were over. The weather forecast for the next few days is rain and thunderstorms, so we probably won’t go out again for a few days. Our next planned adventure may be our first overnight excursion to Annapolis. Will keep you posted. 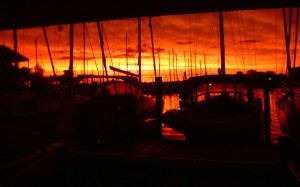 A couple evenings ago a big storm came through. It was forecast by the weather sights so everyone knew it was coming. Very strong wind, lightning, thunder and heavy rain. It was amazing to watch the boats tied to their docks rolling from side to side in unison. Bob tightened our lines and we sat in the cockpit watching the happenings. The storm didn’t last long – maybe a half hour and no damage was done. Afterwards, we were rewarded with a beautiful sunset… as seen here from the cockpit. Last Thursday morning (17 June) we got the boat ready for sailing (less than an hour – which is good)…we knew we weren’t going to leave the marina but I wanted to run a full scale practice session again for storing real glasses, the coffee pot, television (yeah we ended up getting one – now we’ll see if we use it very often), and everything else and anything else that could fly or cause damage (or injury) if we were really sailing. We had a different dock mate (young bloke from Boulder, Colorado – and I will share his story another time), on board to be an extra set of hands as we maneuvered in and out of the slip. We confirmed that we literally only had inches to spare on either side of the wide part of the boat to clear the front pilings. We are talking INCHES (maybe one? on each side). But Bob was able to get out of the slip and then maneuver out of the fairway without having to do the big U turn our neighbor does. Using our bow thruster to maneuver and going into reverse to line up for the tight corner out of the fairway. Then Bob just practiced maneuvering the boat in the open space of the marina, going forward, then reverse, then turning in a circle, just getting comfortable with the way the boat handles. Next he decided to try docking in a different slip and lo and hehold he reversed like a pro, using the bow thruster as his steering mechanism. Then we went to the pump out station dock to practice coming along side that. Again, Bob took it much more slowly this time, and landed perfectly. Then from another angle, as if we were coming back from being out, and again no dramas. A bit farther from the dock this time, but we could easily have grabbed the dock lines with the boat hook or an easy stretch. Okay – now back to practicing in slip 5 again from a different angle…and voila in the slip like a pro. 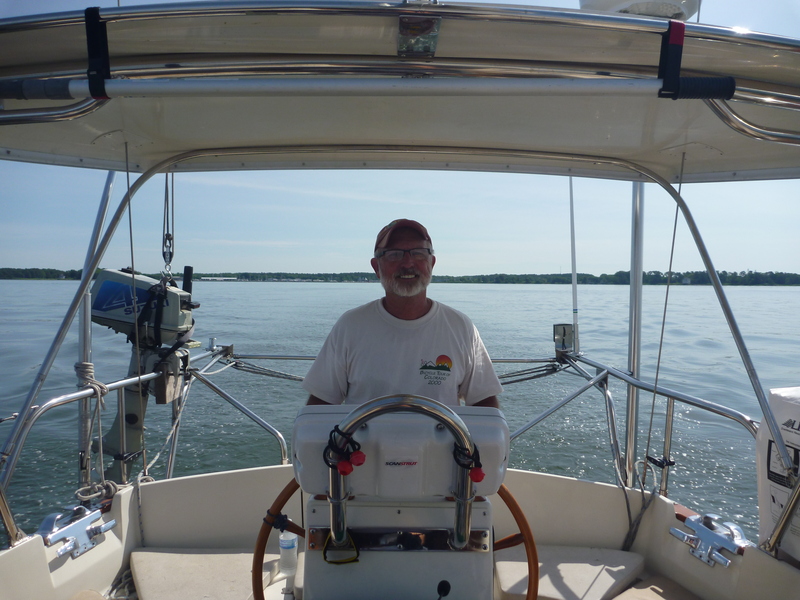 Now it’s time to try our own neighborhood, so we reentered our fairway and Bob was able to back the boat into our slip without hitting the pilings…. AMAZING. Literally there were only inches on either side, with me literally fending off the piling with my arms as we entered. He did it again – FABULOUS! 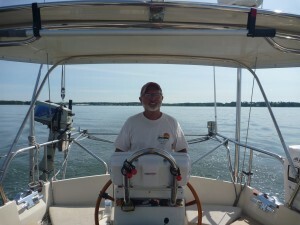 He did all the steering using the bow thruster, not even touching the wheel. Something he wants to improve on – using the wheel, but first things first. But then we decided to try the slip next door which appeared to have a wider opening, and we entered that one so much more easily. Ample room on either side. No concerns on either side. …. and again…. So we decided to stay in the new slip and make sure the marina wasn’t promising it to anyone else. I checked with the office, and no worries. Reinstalling the air-conditioning unit was so much easier this time…. we knew what we were doing and it didn’t take long. Since the new slip has the finger pier on the other side, we then had to set everything up for everything to be on the opposite side of the boat, like the power cord for the shore power. Previously the power plugs were on the same side as our outlet, but no longer. So we have the power cord stretched over the back of the boat now. And my body was used to the movements necessary to get up out of the cockpit, swing over the life lines and get on the finger pier from the other direction. It took a few times for my body to be retrained on how to do it in the new orientation. So I felt like a klutz the first few times getting on and off the boat. We had to move the dock lines and figure out how best to center the boat in her new slip. But finally it felt good. After the boat was safely and comfortably docked we decided to raise the main sail for the first time while at dock. Those that have sailed with us in the past, know this can be a challenging experience with battens getting hung up on lazy jacks – if you don’t know what I am talking about just think about the sail getting hung up on ropes that surround the sail. Raising the sail was indeed a challenge with a few false starts as the sail did get hung up, and then finding where/how the reef lines did as well. We also discovered that one of the reef lines had been rigged backward for so it didn’t run smoothly. But eventually we did get the sail up. Then it was time to lower, and my job was to flake the sail to keep it neat….. well – some of us are better at things than others, and neat sail flaking is not yet one of my fortes. The process did require me to hang on to the gently swinging boom, and move around in some awkward positions – this will all get easier with more practice. We are both so glad we were doing these things for the first time at the dock so we can make sure things are working properly and also see where our challenges will most likely be so we can plan accordingly when we are on the water. All this was done in the heat of the heat, so beer o’clock was called after everything was done, the sail cover re-installed and the boat was ship shape again. The heat came in hard the next few days and we had no desire to do any hard work in the 90+ degree heat and the humidity that just drains all energy. After a MAJOR thunderstorm that rolled in on Tuesday night , we woke up to a beautiful and much cooler day yesterday and decided to play with the sail again. This time I hoisted while Bob lubricated the cars (the things the sail attaches to and that run inside the mast and go up and down the mast). We tried a new technique of moving the jack lines so the sail wouldn’t get caught up…it seemed to work well. But new discoveries of places where the reef lines would still get fouled up which held the sail down when I wanted it to go up. Overall the process was easier this time, but with a few challenges still to be overcome. There is talk of us going out beyond the breakwater today and practicing away from the dock…. stay tuned…. this might mean some real sailing. Dreamtime has left the dock…. Albeit for only an hour if that…. Bob asked our dock mate who has been a Gozzard owner for more than 15 years, first with a G31 and now with the same boat as ours for the past 10 years and has been sailing in the Chesapeake longer than that, to come along and give pointers on navigation markers and the best ways to navigate the harbor in daylight and evening and channel with less risk of running aground. We didn’t raise the sails but did motor out of the channel. Our dock mate also helped Bob approach (and almost hit – but we’re not talking about that) the pump out dock, and then maneuvering into our slip a couple of times letting Bob get used to using the bow thruster to control the direction of the boat in tight quarters. We only ran alongside a piling a couple of times taking up some wood with it….but no harm to the boat. More things to practice and learn. Coming back to dock took a bit more effort to get the boat ready for life at the marina. The biggest frustration was reinstalling the air conditioner. We tried to “improve” the previous setup to only finally learn and acknowledge no improvement was necessary as we couldn’t get everything situated any other way….lesson learned, and now we know without a doubt the first way is not only the best way, but the only way it will work. Once that was done in the heat of the day with what seemed like 100% humidity, Bob stayed busy getting the sail cover back on and the canvas covering the windshield, while I went down below to make lunch and have a cold beer waiting for him. Things learned – with the windshield in place Bob and I can not hear each other….so a set of “marriage savers” are in our future – that is how they are marketed too. Basically they are bluetooth headsets for us each to wear so we can talk to and hear each other from opposite ends of the boat handsfree without having to yell or rely on hand signals that may or may not be seen by the other to communicate status, impending danger or changing plans. Next time out we’ll plan to raise the sails, and see what new surprises and lessons await. The weather has gone from stifling hot and steamy to cold and rainy last week. So fewer weekenders seemed to come down this past weekend. 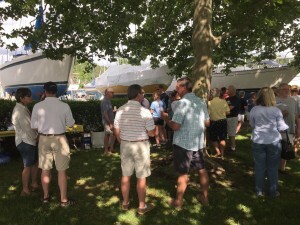 But regardless, the Rock Hall Sailing Club held a wine and cheese sundowner near the pool on Saturday. 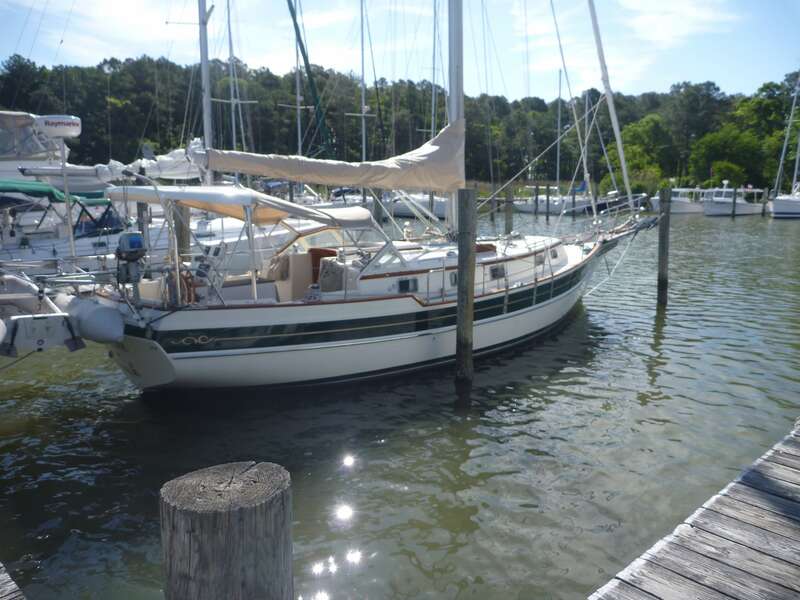 The food, provided by one of the members was awesome and it was yet another great opportunity to meet fellow boat owners, some of whom have been sailing in the Chesapeake Bay for decades. On Sunday our dockmates invited us out on a daysail on their Beneteau 41, Beaujolais. Of course I forgot to bring a camera to capture the moments and sights, but we had great wind and a fabulous day on the water. The captain (another Captain Bob) was gracious enough to let Bob steer, and Bob was able to catch the wind beautifully in the sails and sail us around the numerous crab pots and down a relatively active channel to a lovely anchorage in the Magathy River. We anchored for lunch and enjoyed the relative quiet, of the anchorage watching the horses grazing by the water’s edge. The captain sailed us back and once we cleared the channel we were on a fabulous beam reach making good time and comfortable sailing back to Rock Hall. Not only was the sailing good, but the experience was also great for us to see first hand how another couple handle the dock lines to get in and out of the small finger piers of the marina, maneuver around the fairway to make the tight turn out from where we are nestled in the back, and also how to use the pump out station (used to pump out the holding tank from the head). One of the necessary tasks when you are living on the Bay. Dreamtime was put in the water and settled into her slip on Friday 22 May, and here she has stayed. We moved aboard on Saturday, 23 May, and here we have lived. Internet access is dodgy at best, especially on weekends when there are so many more people in the marina vying for the same signal, so we have not been making updates to the blog or even keeping up with email as well as we would prefer. The dock is its own little community within the larger community of the marina. Most people (95%?) don’t live aboard and are only here for the weekends. So the weekdays are a totally different experience than weekends, and much quieter. We moved aboard on Saturday of the US 3 day Memorial Day weekend holiday, so our first weekend was one of a lot of activity and meeting people on our dock. It was great to meet everyone and were invited to a pot-luck barbecue on Sunday night. One of the first things I have noticed was how helpful everyone is. Whenever a boat is arriving or departing people come out on the dock to assist with lines and fend off so boats have an easier time making the tight maneuvers. Also, if someone has an engine issue (or any other issue) multiple people come by to lend a hand and/or give advice, guidance, and experience. Advice is just a question away. Most boats back into their slips and most people spend their time in the cockpit of their boats, so all you have to do is look up and see who may be around to chat with or often in our case ask for advice. Usually by mid-afternoon of the last day of the weekend, most weekenders have left and the dock and marina are very quiet with very few people about. 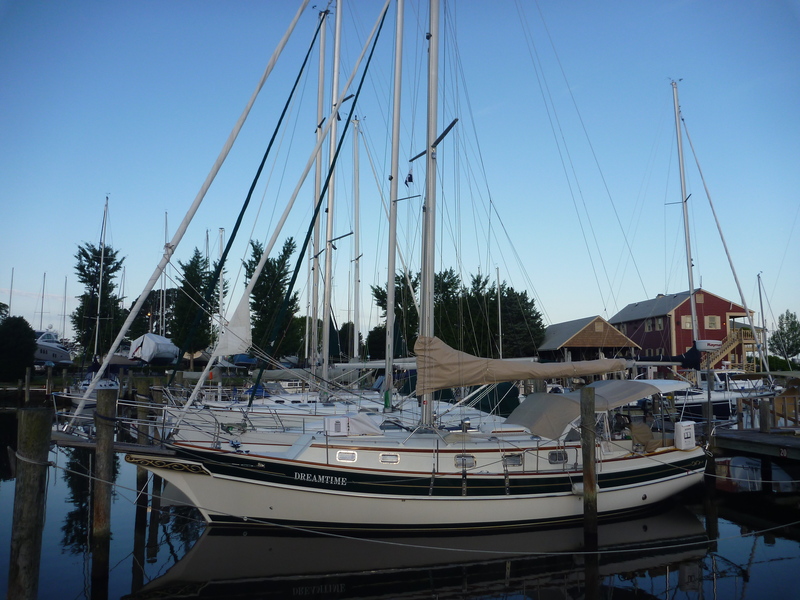 Of the 14 boats on our dock there are 3-4 liveaboards. One is transient and expects to leave in a few weeks time. One lives on the boat 5 days a week and goes back to their land based home for 2 during the summer. And then there are us and a family at the other end of the dock that are here 7 days a week. So you can imagine how quiet it can be during the week. Dreamtime is still a work in process. We have been spending our days cleaning the boat inside and out, moving things aboard, organizing, then re-organizing, getting familiar with the systems, and how things work and cleaning again. We are also making constant runs to West Marine (the marine supply store), the hardware store and the discount store for bits, parts, containers, cleaning supplies, you name it. The days are full on and have been flying by. We definitely are adapting to retirement life as we struggle to remember what day it is. No, we haven’t taken Dreamtime out yet. We were still waiting for some bits and parts to put her together fully. The parts have arrived and we hope the riggers are able to go up the mast to install things in the next day or two. Bob still has to test and learn a few more systems and make sure all is right. We are hoping to untie the dock lines and go for a sail later this week. We’ll keep you posted…that will be another exciting day.